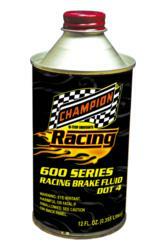 Champion “600 Series” Racing Brake Fluid Dot 4 was developed for extreme racing applications where a maximum dry boiling point is preferred. This Synthetic Racing Brake Fluid is a high-performance brake fluid developed for severe duty racing applications under high heat and extreme pressure and is race-proven by domestic and international top-tier teams. Champion “600 Series” Racing Brake Fluid is featured at this year’s Performance and Racing Industry Show (PRI) as a top-tier performer for extreme racing conditions. The Champion 600 Series Racing Brake Fluid 4 was developed for applications where a dry boiling point exceeding minimum requirements is preferred. The Champion “600 Series” Racing Brake Fluid is a high-performance brake fluid developed for severe duty racing applications under high heat and extreme pressure and is race proven by Domestic and International top-tier teams. The Champion “600 Series” Racing Brake Fluid is designed to withstand excessive heat without boiling or affecting brake performance while maintaining it viscosity, resistance to aeration, compressibility, and lubricity. This proprietary chemistry is purpose built to combat boil-off and the effects of water contamination more effectively than conventional brake fluids.